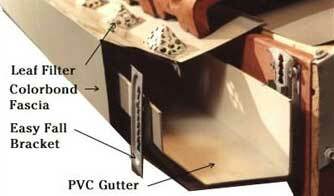 Easy Fall Guttering: The Guttering System that Works! Let the inventor of this amazing unique guttering Sydney system show you how our gutter system works to stop common guttering issues that plague most property owners in Sydney. For guttering in Sydney, call 1800 897 444! We achieve over 75mm (3 inches) of fall inside the system whilst keeping a straight appearance on the outside. The biggest problem with guttering is INCORRECT FALL. At the heart of the EASY FALL™ Guttering is an adjustable bracket which has two adjustments. One for the exterior of the gutter to match the roof line of the home – the other to control the waterflow to your downpipes. When it rains the water drains through the metal Leaf & Ember Guard into the open P.V.C. channel underneath. The adjustable brackets then allow the water to be directed to the downpipes which are also made from P.V.C. The problem of rust is eliminated because the water is being channelled by a non metallic material. The P.V.C. gutter and downpipes are shielded by COLORBOND® Steel which protects it from the sun and gives your home a stylish new look. For guttering anywhere in Sydney, consult our gutter experts by calling 1800 897 444!